In this lyrical, unsentimental, and compelling memoir, the son of a black African father and a white American mother searches for a workable meaning to his life as a black American. It begins in New York, where Barack Obama learns that his father--a figure he knows more as a myth than as a man--has been killed in a car accident. This sudden death inspires an emotional odyssey--first to a small town in Kansas, from which he retraces the migration of his mother's family to Hawaii, and then to Kenya, where he meets the African side of his family, confronts the bitter truth of his father's life, and at last reconciles his divided inheritance. Pictured in lefthand photograph on cover: Habiba Akumu Hussein and Barack Obama, Sr. (President Obama's paternal grandmother and his father as a young boy). Pictured in righthand photograph on cover: Stanley Dunham and Ann Dunham (President Obama's maternal grandfather and his mother as a young girl).From the Trade Paperback edition. frodobaggins (Oakland Park): After reading 'The Audacity of Hope' I wanted to know more about how President Obama's background formed the upbeat, altruistic, intelligent ideas in his book.After reading 'Dreams From My Father', I ordered seven copies for family and friends. 'Dreams From My Father' shed light as to how Mr. Obama was able to formulate his humane, international, open, non-judgemental globallly informed, multi-cultural view of how best to lead America. It would be a wonderful book for American Middle and High School students to read and learn from. Fine unmarked stated first edition hardcover with fine unclipped dustjacket (price $23.00) in Brodart archival cover. Light bump at top front board tip; slight crease to front DJ panel apparently occurring in publication. Else as-new, clean, tight & bright throughout, carefully stored and protected. Guaranteed NOT an ex-lib, remainder or bce, has not been "restored" or doctored in any way. Photos available upon request. Seller: got2mojos books & media, inc.
U.S.A.: Times Books, 1995 A fine first edition, first printing (with complete row of numbers on the copyright page), signed by Barack Obama on the title page. Housed in a custom-made collector's slipcase. Front free endpaper is attached to front pastedown. Comes with a certificate of authenticity.. Signed by Author(s). 1st Edition. Hardcover. Fine/Fine. Westminister, Maryland, U.S.A.: Times Books, 1995. First printing hardcover. This book appears to have been signed and inscribed (to the owner) by Barack Obama on the first title page. The book is very good plus with shelfwear and lightly bumped corners. The mylar protected dust jacket is very good with rubbing, edgewear and some creasing. A nice example of a very scarce book.. Signed by Author. First Edition. Hard Cover. Very Good/Very Good. New York: Times Books, 1995. Ex-Library. Very Good. Hardcover. Signed by Author(s). First Edition. 1995 Times Books TRUE STATED FIRST EDITION with typical Random House # line to "2." With a **SIGNED** card by PRESIDENT OBAMA ( and a 100% guaranteed COA). pasted onto the half-title page. Though ex-library this copy was clearly little circulated and has very minor markings: some stamps at the top page edges and 2 small stamps on the inside rear board. There is some color bleed at the base of the spine end on the rear board as well. Otherwise in VG/VG+ condition. The unclipped ( $ 23) DJ has been continuously wrapped so there is basically no wear . **Bonus** In addition receive an invitation to his First Inauguration on a 10x12 paper with raised gold seal. Plus both the Time magazine Special Commenmorative Edition of Obama's Inauguration & the 2009 five ties publ. First/First Official Inaugural Book in F/F MINT condition. A terrific set!. Times Books / Random House, 1995. First printing. Hardcover. Fine/very good. Octavo; xi, [xii], 403 pages; two yellow price labels from NYC's famed Strand Bookstore (from 1997, and 1998) on the front pastedown; there is a pinhole puncture starting a short, closed tear on the spine of the dust jacket, a defect which is only slightly noticeable because it part of the dj illustration which wraps around across the spine title. Inscribed on the half-title page by Barack Obama: "To Jean and Paul / Thanks for all your / friendship and support !" F. Paul Mooring was a physicist at Argonne National Laboratory. He and Jean spearheaded the creation of the Illinois Prairie Path. He was on the DuPage Conservation Commission, the Conservation Foundation and served as president and treasurer of the Illinois Audubon Society. The Moorings were early supporters of Obama as an Illinois State Senator, and in his following campaigns for U. S. Senator from Illinois, and President of the United States. Note: this book had only one printing in its first edition, and many of those went to lending libraries, and other copies were remaindered. It bears no remainder marks, but that may be how The Strand bookstore acquired it. Unlike today, few people wanted it prior to 2004 - except State Senator Obama, who bought remaindered copies after his supply of author's copies was exhausted. Westminister, Maryland, U.S.A.: Times Books, 1995 A fine first edition in a fine dust jacket, with First Edition stated on the copyright page, and complete row of number from 9 to 2, which is how this publisher, Times Books, designated a first printing. This is the true 1995 first printing, not to be confused with the reissued edition. Housed in a fine custom-made cloth slipcase.. 1st Edition. Hardcover. Fine/Fine. New York: Times Books, 1995. Hardcover in non price-clipped dust-jacket. 403pp., True Times Books First edition, first printing using the Randon House number string 9-2 (Random House did not use "1" but rather removed words "first edition" when going to 2nd printings.) Correct price on dust-jacket flap: $23.00. Black cloth spine with gold lettering over white boards. No previous ownership marks. No remainder marks. A very clean, square, tightly bound copy of Obama's first book, now very scarce as most of the initial 7500 print run went to libraries. Book has no faults and appears new, dust-jacket has no tears or chips and only a hint of shelf-wear. A very nice copy of a very difficult to locate book. Fine in a near fine dust-jacket.. First Edition. Cloth Spine Over Boards. Fine/Near Fine. 8vo - over 7¾" - 9¾" tall. U.S.A.: Times Books, 1995 A fine first edition in a fine dust jacket, housed in a custom-made collector's slipcase. Stated First Edition and correct row of numbers on the copyright page.. 1st Edition. Hardcover. Fine/Fine. Crown Publishers, 2004 Fine in a fine dust jacket. First Printing of the 2004 reissue of the author's first book with correct numberline 10 9 8 7 6 5 4 3 2 1. Signed by President Obama on the title page. Scarce in the first printing. Housed in a custom-made slipcase.. Signed by Author(s). 1st Edition. Hardcover. Fine/Fine. Broadway Books, 2004. Soft cover. Fine/No Jacket issued. Signed by author. Revised Edition. Very minor shelf wear with remainder mark on bottom of text block. NOT INSCRIBED and unread. Great gift. Definition below: "A remainder mark is just that - a mark to the page edges of a book. This mark is placed on the page edges by a publisher"- For this instance, this is a pen stroke on the text block on the bottom of the book and does not affect anything. All books are in our inventory. This is a family run business and not a warehouse. All books are NOT EX-Library, unless stated. Mylar jackets are available upon request for an additional $2. Tracking will be provided by email. International Customers- If this is large book, please reach out for a shipping rate. Dreams From My Father: A Story of Race and Inheritance. New York: Crown Publishers, 2004. First edition, first printing of the 2004 reissue of the future President's first book. Octavo, original half cloth, illustrated. Boldly signed by Barack Obama on the title page. Fine in a fine dust jacket. Jacket collage by Steven Dana. "All men live in the shadow of their fathersthe more distant the father, the deeper the shadow. 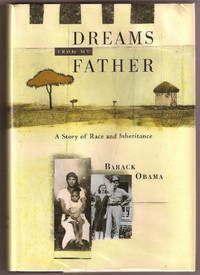 Barack Obama describes his confrontation with this shadow in his provocative autobiography and he also persuasively describes the phenomenon of belonging to two different worlds, and thus belonging to neither At a young age and without much experience as a writer, Barack Obama has bravely tackled the complexities of his remarkable upbringing" (The New York Times). In discussing Dreams from My Father, Nobel Laureate Toni Morrison has called Obama "a writer in my high esteem" and the book "quite extraordinary." She praised "his ability to reflect on this extraordinary mesh of experiences that he has had, some familiar and some not, and to really meditate on that the way he does, and to set up scenes in narrative structure, dialogue, conversationall of these things that you don't often see, obviously, in the routine political memoir biography. It's unique. It's his. There are no other ones like that." New York: Three Rivers Press, 2004. Revised Edition. Paperback. Fine. Octavo (soft cover), xvii, 453pp, [4pp]. Brightly illustrated covers, never read. Stated "revised edition" on copyright page, with number line from "17-20." Inscribed by President Barack Obama on title page, in black pen. Includes JSA certificate of inspection and authenticity, with sticker affixed to last page of book. As the name recognition of Barack Obama increased following his address to the Democratic National Convention in 2004, he switched to a short form signature, often in sharpie pen. This long-form signature is sought out by presidential collectors. New York: Kodansha International, 1996. First Kodansha Edition. Paperback. Near fine. Octavo (softcover), 403pp, [advertisement]. Brightly illustrated covers, appears unopened. Bumped corner along bottom edge of spine. Inscribed by future President Barack Obama on half title: "To Audrey - Wishing you all the best! Barack Obama. 5.21.04" Signed with felt tipped pen. As the name recognition of Barack Obama increased following his address to the Democratic National Convention in 2004, he switched to a short form signature, often in sharpie pen. This long-form signature from 2004 is highly desirable for collectors. New York: Times Books, 1995. A First Edition, First Printing. Hardcover. Near Fine/Near Fine. Near fine in a near fine unclipped dust jacket. Indentation at the top of two pages in the middle of the top edge, probably form a paper cliip. Extremely light wear to the book and jacket, just a hint of shelf wear to the bottom of the boards, and light crimping to the spine ends. New York: Times Books, 1995. A First Edition, First Printing. Hardcover. Near Fine/Near Fine. Near fine in a near fine unclipped dust jacket. Remainder mark on top edge. Very light wear to the book and jacket, just a hint of shelf wear to the bottom of the boards, and light crimping to the spine ends. Random House Large Print, 2008-04-29. LRG. Paperback. Used:Good. New York: Times Books. Nearly fine copy in fine dust jacket. 1995. 1st. hardcover. 8vo, 403 pp., First printing of the first edition., A small patch of discoloration on the bottom of the rear board, else fine. .
New York: Random House / Times Books, 1995. First Edition. Hardcover. Very Good. First edition, first printing. Very Good in a Very Good unclipped dust jacket. Faint tidemark to top edge of boards and dust jacket. Gilt stamping on spine lightly rubbed. Small burn mark to gutter of front endpaper, which appears to be a common binding issue with this title. Remainder mark to bottom edge of page block. A very lovely copy of the true first edition. New York: Three Rivers Press, 2004. Revised Edition. Paperback. Good. Octavo, xvii, 457pp. Paperback, illustrated panels, crease along top edge of front panel, wear to covers. Signed by President Obama at rally in Cincinnati in 2008. Previous owners signature on half title, above Obama signature. Signature is PSA approved, with sticker on rear of half title. An affordable way to own a signed book by the 44th President of the United States. 1995-04-03. New. Ships with Tracking Number! INTERNATIONAL WORLDWIDE Shipping available. Buy with confidence, excellent customer service! Times Books. Hardcover. 081292343X Like New Condition. . Fine. Times Books. Hardcover. 081292343X New Condition. . New. New York: Three Rivers Press, 2004. Oversized paperback. Very Good +. SIGNED IN A STRONG FLOURISH BY PRESIDENT OBAMA (THEN SENATOR OBAMA) on the title page, just below his printed name. A very solid copy to boot of this 2004 paperback reprint. Tight and VG+ in its pictorial wrappers, with just a touch of light staining at the rear pastedown and very mild waviness to the top-edges of the last 30 or so pages. Thick octavo, President Obama's first published book, originally issued in 1995. Times Books, 1995-07-18. 1st. Hardcover. Used:Good. Three Rivers Press, 2004. Softcover. Fair Condition. Signed by Author. Some creasing and discoloring; a couple stains at the top of the title page; a couple bent corners. Signed by the former President on the title page. Quantity Available: 1. Shipped Weight: Standard Weight. Category: Biography & Autobiography; Signed by Author. ISBN: 1400082773. ISBN/EAN: 9781400082773. Inventory No: 167382. .
2008-03-09. New. Ships with Tracking Number! INTERNATIONAL WORLDWIDE Shipping available. Buy with confidence, excellent customer service! RARE. Signed by Barack and Michelle Obama on title page; 1st ED later printing, excellent condition. HC+DJ not clipped, no cover dents, tight unread binding, clean text; ships with care. 1st Edition 18th printing, signed "Dream big dreams, Barack Obama" on title page; HC+DJ not clipped; tight binding, clean text, no cover dents, no marks; ships with care. New York: Crown Publishers, 2004. 1st printing of the Reprint Edition of President Obama's outstanding memoir. Clean, crisp and unmarked. Fine/Fine. 442pp. Dust jacket offered in a new mylar cover.. First Edition. Hardcover. Fine/Fine. 8vo - 8" - 9" Tall. Cary, North Carolina, U.S.A.: Kodansha Amer Inc, 1996. First Printing of this hard to find original Kodansha paperback. Near Fine condition, tips slightly less sharp than new. Covers lay flat, showing very little wear, appears unread. photos available.. First Edition. Soft Cover. Near Fine. Crown, 2007-01-09. Hardcover. Very Good. First printing 2004 edition in price intact jacket, clean tight and unmarked. Please email for photos. Random House Large Print, 2006-04-04. Hardcover. Used:Good. 2009-03-04. Good. Ships with Tracking Number! INTERNATIONAL WORLDWIDE Shipping available. May not contain Access Codes or Supplements. May be ex-library. Shipping & Handling by region. Buy with confidence, excellent customer service! 2007-05. Preloaded Digital Audio Player. Good. 2006-03-05. Good. Ships with Tracking Number! INTERNATIONAL WORLDWIDE Shipping available. May not contain Access Codes or Supplements. May be ex-library. Shipping & Handling by region. Buy with confidence, excellent customer service! 2005-04-03. New. Ships with Tracking Number! INTERNATIONAL WORLDWIDE Shipping available. Buy with confidence, excellent customer service! 2007-05-06. New. Ships with Tracking Number! INTERNATIONAL WORLDWIDE Shipping available. Buy with confidence, excellent customer service! 2004-07-08. New. Ships with Tracking Number! INTERNATIONAL WORLDWIDE Shipping available. Buy with confidence, excellent customer service! 2016-12-01. New. Ships with Tracking Number! INTERNATIONAL WORLDWIDE Shipping available. Buy with confidence, excellent customer service! 2008-04-01. New. Ships with Tracking Number! INTERNATIONAL WORLDWIDE Shipping available. Buy with confidence, excellent customer service! 2004-09-03. New. Ships with Tracking Number! INTERNATIONAL WORLDWIDE Shipping available. Buy with confidence, excellent customer service! Broadway Books. Used - Very Good. Very Good condition. Times Books. Hardcover. 081292343X Good+; Hardcover, No Jacket; 1995, Times Books; True first edition published by Times Books in 1995; Clean covers with just a few light handling marks and moderately "bumped" edge-corners; Unblemished textblock edges; Pages clean & unmarked; Good binding with straight spine; Tan cloth covers with black cloth covering over spine, and title in gold lettering along spine; 403 pages; "Dreams from My Father: A Story of Race and Inheritance," by Barack Obama. . Good. New York: Crown Publishers, 2004. 1st printing of the Reprint Edition. Prior owner's name and date inked on title page, otherwise a clean, crisp copy. VG/VG. 442pp. Dust jacket, with very slight signs of handling, offered in a new mylar cover.. First Edition. Hardcover. Very Good/Very Good. 8vo - 8" - 9" Tall. 2008-03-07. Good. Ships with Tracking Number! INTERNATIONAL WORLDWIDE Shipping available. May not contain Access Codes or Supplements. May be ex-library. Shipping & Handling by region. Buy with confidence, excellent customer service! Canongate Books Ltd, 2007-01-01. Paperback. Used:Good. 1995-04-03. Good. Ships with Tracking Number! INTERNATIONAL WORLDWIDE Shipping available. May not contain Access Codes or Supplements. May be ex-library. Shipping & Handling by region. Buy with confidence, excellent customer service! Crown, January 2007. First Edition. Hardcover Hardcover. Used-Very Good/Good. Firet edition, first printing of the Reprint edition. Crown. Hardcover. 0307383415 2004 Crown hard cover - 1st edition 9th printing - a fine clean like new collectible with like new dust jacket (now in mylar cover) enjoy . Fine.